Parents often fail to recognize that their children are watching and taking in the news in a traumatic way. Adults have the intellectual and emotional capacity to better understand the graphic images and information shown on television when a tragic event or disaster occurs. Young children do not. They may believe that old events are happening right now, or that they are happening if they see footage repeated on the news. It’s best to keep the television off and watch it after the kids are asleep, or read the news online. Children often listen more keenly than parents recognize. Talking about traumatic or upsetting events in front of your child may have unintended results. Parents should not burden their children with their anxiety. Instead speak with other adults about tragic events away from your young children. If children become aware that something bad has happened, the most important thing a parent can do is let them know they are safe and that their parent is in control. If parents remain as calm as possible, children will naturally feel calmer and suffer less anxiety. Use the comfort of routine and familiarity to calm children and establish their sense of security and safety. How much a parent should share with their child about a tragic event depends on the child’s age and level of development. Young children will not benefit from being told about tragic events unless they will be directly affected by it. 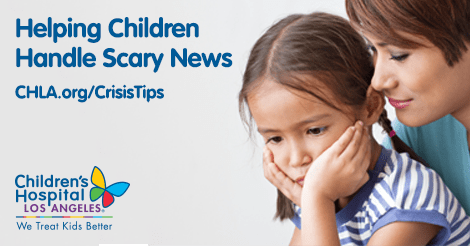 For older children, parents can share basic information with them so that they do not hear about it elsewhere and become frightened. Once this basic information is shared, let the conversation be led by the child—wait to see what questions that the child has and respond to them in a manner that is appropriate for their age and development. Do not force a child to talk about a traumatic event; let them know that you are always available to answer their questions. It is common for a child to take time to process something and come back later with new questions. Children with prior trauma, recent loss, or a history of anxiety are likely to be more vulnerable when experiencing potentially traumatic events. As always, if you are concerned that your child may be experiencing anxiety or trauma, seek help as soon as you can. Being supportive of your child, and getting help early are key factors in recovery. A good place to start is to speak with your child’s pediatrician, who can help you identify the best next step for your child.